While Hikaru Utada boasts the No. 1, 4 and 8 biggest-selling albums in Japanese history, and despite her New York upbringing and strong English, her 2004 stab at Western success fell embarrassingly flat. That album, “Exodus,” was a flawed masterpiece — sonically original, but too left-field, moody and haphazard to dent the U.S. charts. This time she is taking no chances. 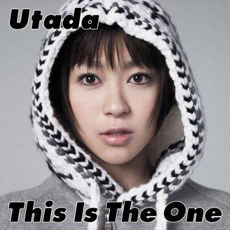 “This is the One” is by Utada’s own admission an aggressively commercial album that teams her with the superproducers behind Ne-Yo, Beyonce, Madonna and Rihanna to basically make her music as bland, accessible and predictable as possible. The result is slick R&B pop that panders to the ears of “American Idol” fans — though sometimes comes off as a confused half-breed. There are good bits: the playful, sassy “Me Muero”; a clever appropriation of the refrain from Ryuichi Sakamoto’s “Merry Christmas, Mr. Lawrence” for the simmering groove-out “FYI”; and the lush harmonies and creative beats that typify an Utada record. But her dark, intimate vocal stylings sound small on tracks built for the lung power of Beyonce, Xtina et al. While “Exodus” included some terrible lyrics (and some that were truly inspired), “This is the One” is practically X-rated at times. On “Dirty Desire,” Utada sings, “During my 9 to 5, I’m thinking six and nine”; and on “Automatic Part II” (a nod to her hit debut single, “Automatic”), she sings, “Contraceptive, when I’m on it, it’s automatic.” Is this what it takes to find Stateside success? Whoring yourself both musically and lyrically? Good luck to Utada in her quest to become a star in the West. But wouldn’t it be cooler if she did it on her own terms?